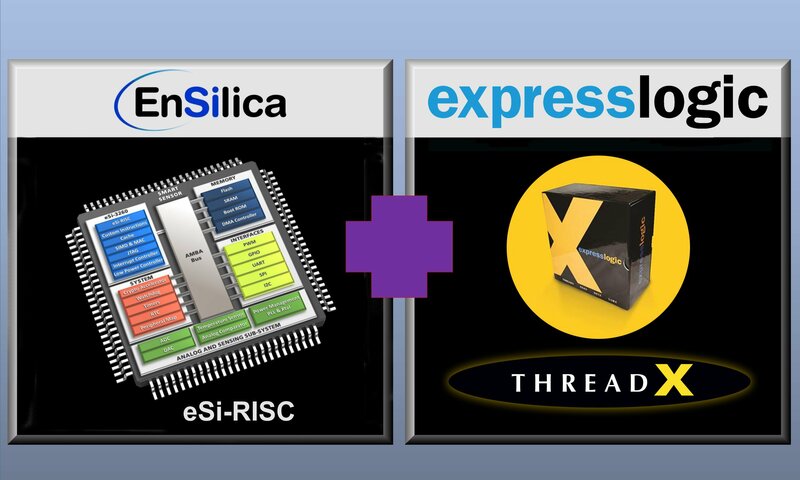 UK silicon designer EnSilica is working with Express Logic to port the ThreadX real-time operating system (RTOS) to EnSilica’s eSi-RISC family of configurable embedded processor cores writes Nick Flaherty. The royalty free RTOS provides an intuitive, highly functional API and advanced, instant-on features as well as efficient real-time responsiveness and code compactness that appeal to developers of deeply embedded consumer and industrial electronics. The UK-based company, founded in 2001, provides low power ASIC/FPGA design services to semiconductor companies and OEMs worldwide. The eSi-RISC family of highly configurable and low-power soft processor cores scales across a wide range of applications and uniquely support both 16-bit and 32-bit configurations. The cores have been extensively silicon proven in a variety of ASIC technologies down to 28nm. The eSi-RISC family includes the eSi-1600 16-bit processor, eSi-3200 32-bit processor, eSI-3250 32-bit processor, eSi-3250sfp incorporating a single precision floating point processor, eSi-3260 32 bit processor with SIMD DSP extensions and eSI-32X0MP 32-bit scalable, asymmetric multicore processor. The processor cores also benefit from a configurable memory architecture and configurable cache options. In addition to providing IP and turnkey ASIC/FPGA development, EnSilica also provides point services to companies with in-house ASIC design teams. The combination of eSi-RISC and ThreadX gives a small footprint, high-performance and low-power characteristics that, when combined with ThreadX’s pre-certification for many safety standards, makes it suited for IoT and industrial applications. Express Logic’s companion X-Ware software features ThreadX fully integrated with Express Logic’s FileX high-performance MS-DOS compatible file system, NetX high-performance implementation of TCP/IP protocol standards, and USBX high-performance USB host, device, and On-The-Go (OTG) embedded stack.